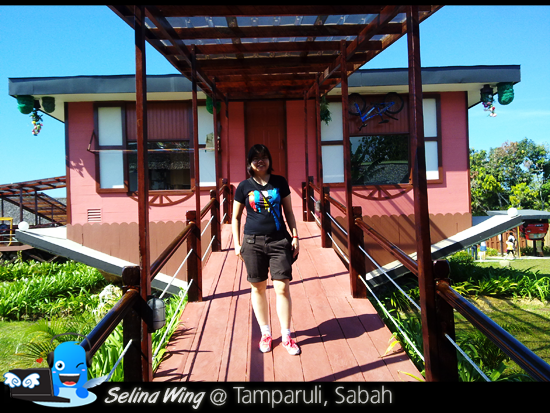 On the second day of my Sabah trip (21 August 2012), I went to the Upside Down House which located at Kampung Telibong, Batu 21, Jalan Telibong, Tamparuli (Rumah Terbalik yang Pertama di Sabah) before going to the Kinabalu Park, Poring Hot Spring and Canopy Walkway. 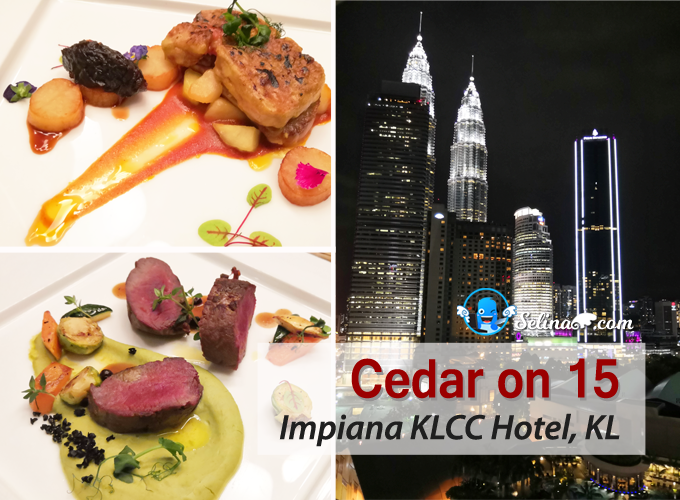 If you go from a city, Kota Kinabalu, just a few Kilometer before Tamparuli town and before a Shell gas station, it takes about 40 minutes or less than 1 hour only. You can use a taxi or tour bus, better. My family and I joined the tour group, Borneo Legend to get there. 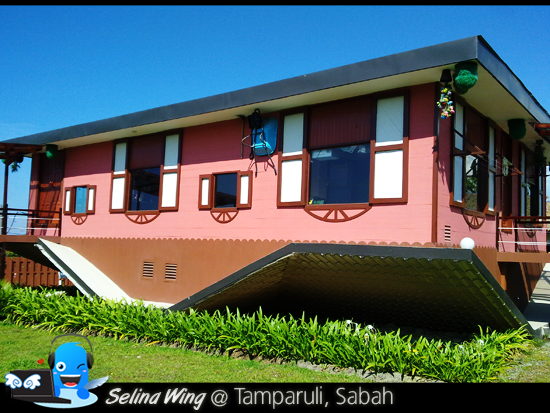 Do you ever visit Upside Down House before? 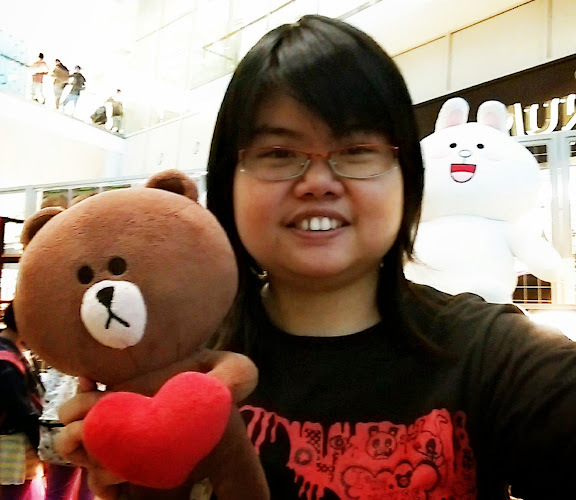 I bought a ticket cost RM 5.00 only while I showed my disability card (OKU kad - Orang Kurang Upaya). 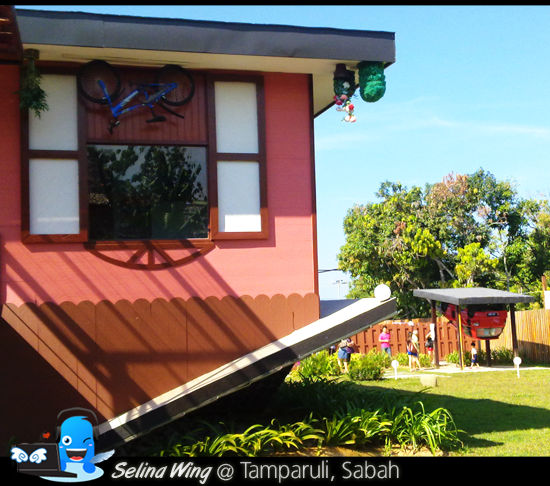 It looks like a traditional Sabah village house from outside. The interior area is about 1,500 square feet, with master bedroom, a child room, living room + kitchen and a bathroom. A staff let us explore anything around this house 1st before we entered inside. 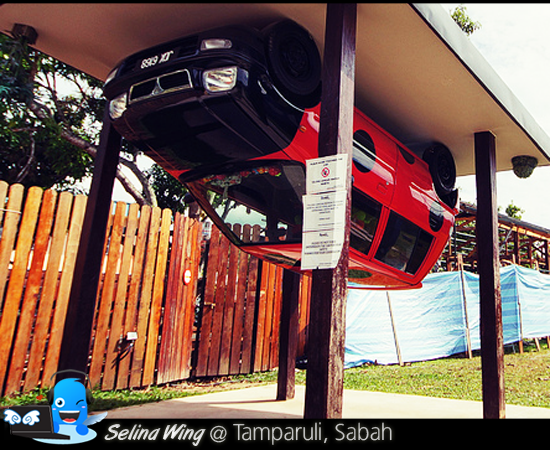 First time, we saw the upside down Kancil car just right in front of the parking lot. A Kancil car also are Beetle Bug!! It is very cute. 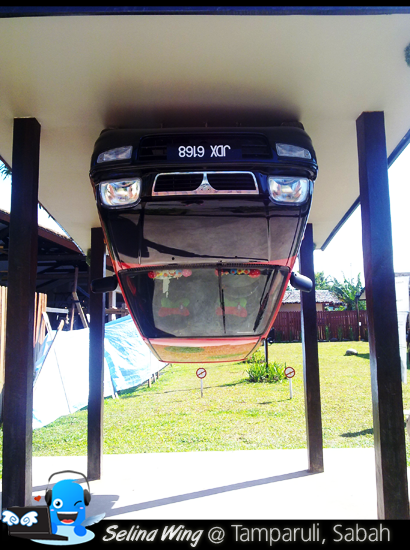 I think about how they to make a heavy car can be upside down? 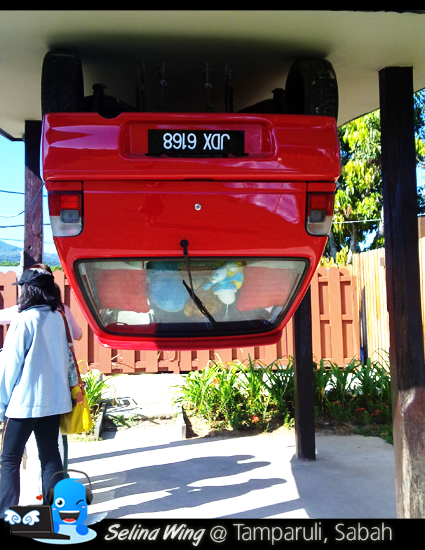 Many people busy to take many photos on Beetle Kancil car! Long time I don't drive a Kancil car, so I miss it! 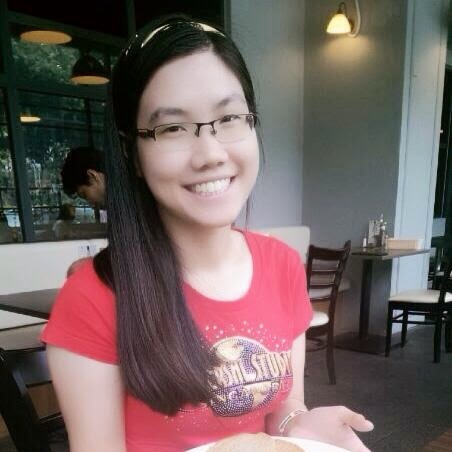 Haha, after we take photos around this house then we walk along the way to the entrance door. A staff guided us and explained about Kadazan family stayed in the traditional Kadazan village house. We were asked to knock the door when we visited a real house. 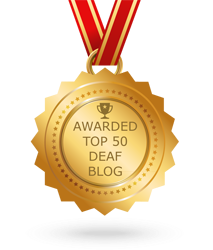 My mom knocked on a big door, then we allowed to enter inside! Sad, we are not allowed to take photographs inside the house because they make everyone curious to visit the Upside Down House! We were walking on the “ceiling”, with fans, and lamps next to our feet. And all the furnitures are above our head. I shocked to see a cat is sleeping on top! Let’s see what they have inside… old TV, VCR player, microwave, computer & desk, chairs, sofa, beds, cabinet, washing machine, cabinet, closet, etc just like a normal house. They even have poker cards, toys and comic book scattered on the floor (top). Can you spot which is one bicycle and Kancil car? 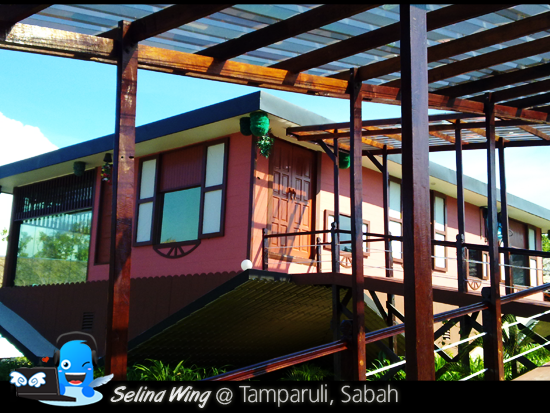 It is known as Rumah Terbalik, I was amazed by the intriguing architecture involved in building this extra ordinary home. 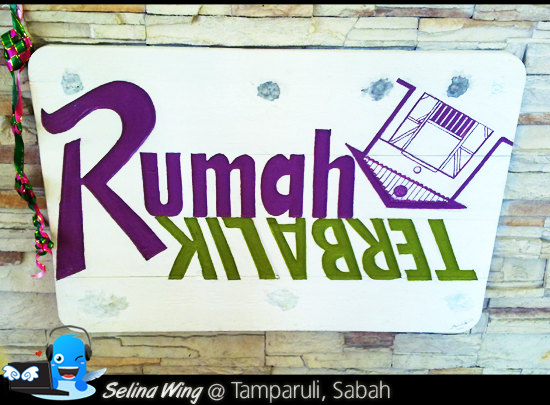 The visitors can enjoy to eat a meal or snack at the Rumah Terbalik Café or buy the souvenir at the Gift Shop. My mom asked a staff about the cost of buliding on Rumah terbalik because she are curious only. 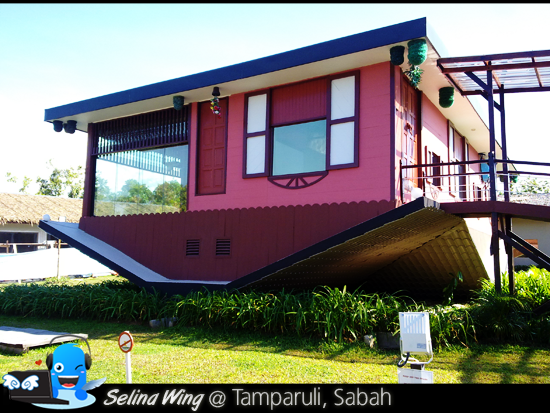 We shocked that the cost of building this upside down house is about RM1 million in Tamparuli by entrepreneur Alexander Yee, it was opened in last year, February 2012. I heard that they want to build more bigger in future! 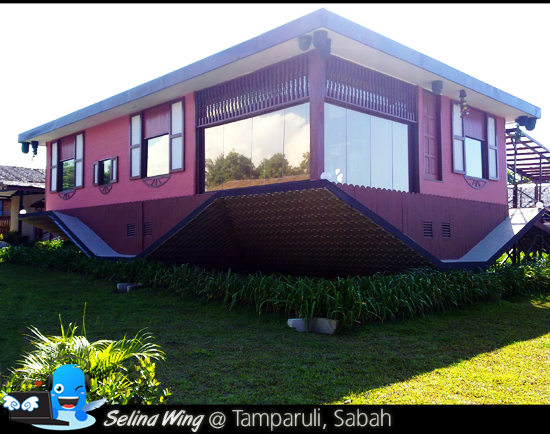 What are you thinking of the Upside Down House (Rumah Terbalik)? The operation time: 8.00am to 10.00pm. Ticket Price: For Malaysian, RM10.00 for Adult / For Non-Malaysian, RM 18.00 for Adult. RM5.00 for Child. Free of Charge for Below 2 years old. For OKU (Orang Kurang Upaya ) Holder Card, RM 5 only. I think they sure know what to do with this problem issues.. :P If they want more visitors attracted to this, they sure doing a very great job. But I feel dizzy when I see everything be upside down!